First of all – yey you! You’re thinking of having a go at yoga! This is awesome news. I know that trying anything new for the first time can be totally bewildering and scary, so thank you for taking a brave step in a new direction. If we haven’t met before, my name’s Meg and I’m the Founder of Real Life Yoga. I offer totally un-scary yoga sessions for anyone who has always wanted to try yoga but didn’t think they were bendy enough, thin enough, or owned enough Lycra. 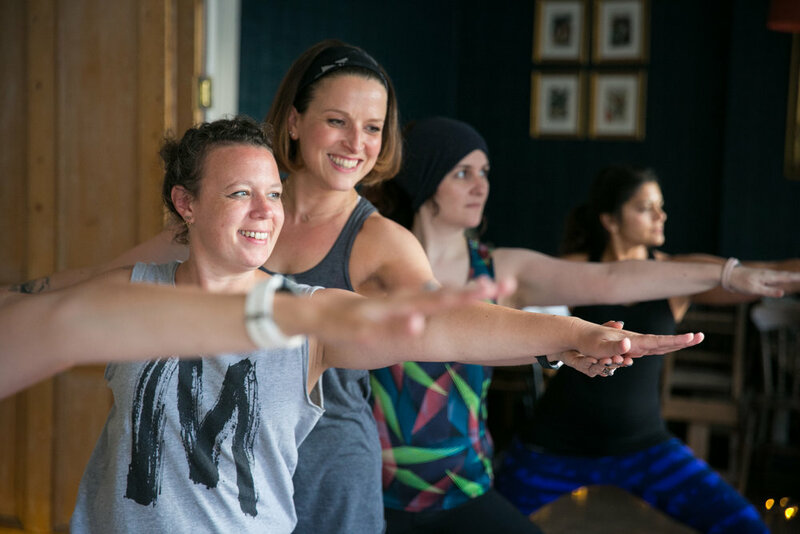 These sessions are for complete yoga beginners; designed to get any body feeling good on a yoga mat and feeling blooming great when you’re off it too! This totally beginner-friendly workshop has been designed to help you feel more comfortable about taking your first steps into a yoga class, or perhaps starting to do your own practice at home. 2pm: We’ll get settled and have a chat about what yoga is, and all the things it isn’t. (Spoiler alert #1 – it’s not just being bendy.) We might share why we all want to give it a go, and what has put us off taking the plunge before now. 2.30pm: Starting with some easy meditation, we’ll then begin to work through the poses. Don’t panic - as long as you can breathe and move at the same time, you’ll be fine. 3.45pm: Tea break and chat – an opportunity for us to continue sharing stuff. How we thought the practice went; what was easy; what was challenging; what our favourite cake is….etc. 4.15pm: We’ll finish with some simple breathwork practices; along with the poses, these easy ways to connect with your breath can be invaluable yoga tools to take into your every day life. Look! We're smiling! That's how much fun yoga is! A thorough grounding in the basics of yoga. An opportunity to connect with your breath, move your body, calm your mind, and feel flippin’ awesome. 3 hours of learning practical tools and ideas you can take into your everyday life. The opportunity to learn in a super-small group (this workshop is limited to only 10 people). All you need to take yoga into your Real Life: a pdf of workshop notes will be emailed to you. Your investment: £45. This includes the 3-hour workshop, tea and treats, plus post-workshop notes. Look how yogic we are....thinking about cake. Yum. This workshop really is for total beginners, but if you have any serious medical issues you should check with your doctor before booking and participating. Please inform Meg prior to booking if you have any serious conditions or mobility-limiting issues. The workshop is located on the second floor of Crystal Palace Osteopaths which can only be accessed via 3 flights of stairs. If you have any dietary requirements or allergies, please contact Meg so that she can make appropriate choices when deciding on cakes! If you have any questions or queries don’t hesitate to contact Meg on or 07747 481688 or email Meg. CANCELLATIONS: Any cancellations received on or before Sunday 2nd December will receive a 50% refund. Any cancellations made after this date will not receive a refund in part or whole. This sounds amazing. I need to come. Book me in! "Marvellous Meg! Had an absolutely fantastic afternoon at the Workshop for the Un-bendy. It was a great ice-breaker into Yoga for me as someone who was intimidated by the thought of joining a class. Meg has a great way of making you feel relaxed. There were many funny moments in the workshop! I really enjoyed myself and learned some stuff too. I would recommend this workshop to any beginner and you get cake too! Many thanks Meg." - Kelly Anne. Don't forget - I want to keep this workshop really nice and cosy, so I'm only opening it up to 10 students. Book today to make sure you're one of them.